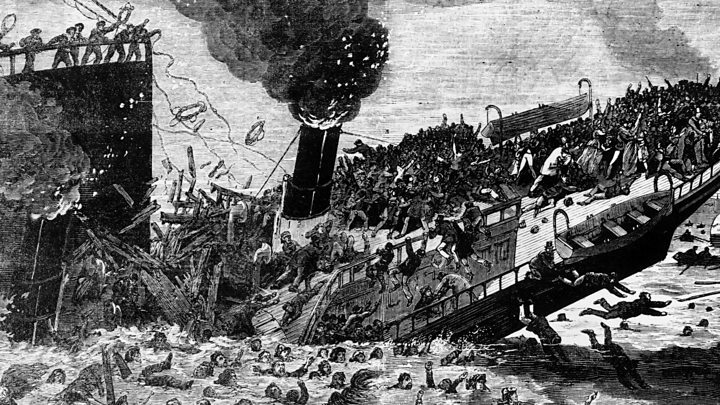 The Princess Alice sank in the River Thames on 3 September 1878, killing hundreds of ordinary Londoners returning home from a day trip to the seaside. The tragedy, now largely forgotten, dominated newspaper headlines and led to changes to the shipping industry.A boatman hooks another body out of the foul-smelling Thames, a grisly prize that will earn him five shillings. A few days before, the Princess Alice had been smashed in two as it returned to London packed with men, women and children who had been on a trip to Kent. About 650 lives were lost and for weeks bodies decayed in the polluted water or washed up on the riverbank. It was an inexpensive trip - tickets were about two shillings, depending on which stop passengers travelled to. Most of the approximately 700 people on board were upper working-class or lower middle-class families.The children were tired but happy after their day at the famous Rosherville Pleasure Gardens in Northfleet, playing on the promenade at Sheerness or wandering around the popular resort of Gravesend.As the evening drew in, many families took the fateful decision to retreat inside the saloon or to their cabins below.It was a move that sealed their fates. Alfred Thomas Merryman, a chef, had been asked at the last minute to work on the ship.The 30-year-old father of four from Bow, east London, was no doubt grateful for the extra cash, as well as the rare opportunity to escape the dirty streets of the capital.At about 7:40pm, as the Princess Alice neared North Woolwich Pier, he was standing on the deck by the saloon door.Just as he was saying how "splendid" the voyage had been, he saw a huge collier (a coal-carrying ship) bearing down on the smaller vessel. The Bywell Castle ploughed straight into the starboard side of the Princess Alice, which weighed less than a third of the 890-ton collier.The vessel sliced the Princess Alice in two with a sickening crash. "The panic on board was terrible, the women and children screaming and rushing to the bridge for safety," Merryman's witness account reads. "I at once rushed to the captain and asked what was to be done and he exclaimed: 'We are sinking fast, do your best. '"Those were the last words he said. At that moment, down she went." As a model held by the National Maritime Museum shows, the ends of the ship rose into the air as the middle sank, sending people on deck hurtling into the watery chasm between.Merryman and others on deck were pitched into the churning river, while the unfortunate passengers below deck were trapped. Tons of untreated sewage spewed from outlets near where the boats collided.The water bubbled with raw detritus, giving out a stench strong enough to leave even the hardiest boatman gagging. The men, women and children thrashing about in the water breathed in lungfuls of toxic waste. Despite crew members of the Bywell Castle throwing down planks of wood, lifebuoys and even chicken coops for people to cling to, the heavy Victorian clothes of those in the water dragged them down. For many, death was inevitable.Deafened by the screams of his doomed fellow passengers, Merryman clung to a piece of wreckage to stay afloat.But when about 20 desperate people grabbed hold too, it sank. He started swimming - one of the lucky few who could - and lunged for a rope hanging over the side of the Bywell Castle. He was hauled to safety along with four others. Other survivors described being overwhelmed by an instinct for survival.One man told the Illustrated Police News - a somewhat sensationalist tabloid - how he had to push drowning people off him to reach safety.Claude Hamilton Wiele said: "I found my brother swimming about. We are both good swimmers, and we made for the screw steamer. "The 20-year-old clerk added: "The water was full of people... we had great difficulty in avoiding them. "A woman clutched me, but I got away, and I saw her go down like a stone." Merryman was taken to South Woolwich Pier after he was retrieved from the water. "There were others also rescued but few recovered," he said. "One boy died on my lap. "The chef was one of about 130 people pulled from the river alive - several of whom died in the following days and weeks, in part from complications from swallowing the putrid water, The Times reported.Robert Haines, a musician in the Princess Alice band, was also saved.The double bass player was fond of ships and had noticed the Bywell Castle a couple of minutes before the collision. It looked to him as though the collier was heading straight for the smaller boat but he thought little of it, having faith the Bywell Castle would alter its path. The musician was about to follow his fellow band members downstairs for a break.He was only about 3ft from the bow of the Bywell Castle when it struck.For a split second, Haines was frozen in his tracks, not knowing what to do with his bulky instrument.But he then dropped the double bass and ran up on to the saloon deck. 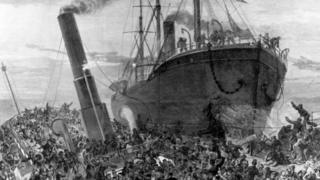 "In one instant I might say, the fore part severed from the stern and I saw them all go down like a band box," he said. "Everybody went down except myself." Haines could not swim, but managed to grab hold of a lifebuoy. He was pulled on to a boat that had been launched from the Bywell Castle.The men on board dragged a few more survivors from the water - as well as dead bodies - before rowing to safety.Other small boats on the river came to the aid of drowning passengers, but the rescue mission soon became a morbid effort to recover as many bodies as possible.In a matter of minutes children had been orphaned, husbands and wives widowed, and whole families wiped out.Bodies washed up from Limehouse to Erith for days after the crash.The dead were laid down in their hundreds in temporary mortuaries that popped up across east London - including at Beckton Gas Works, Woolwich Dockyard, the office of the London Steamboat Company and Woolwich Town Hall. However, the simultaneous Board of Trade inquiry came to different conclusions - despite many of the same witnesses giving evidence.Instead of arguing that both vessels were to blame, it postulated that the Princess Alice had not followed waterway regulations and was entirely at fault.Concerns were raised in Parliament for years after the disaster to ensure that positive change came out of the tragedy.From who was responsible for paying for the burials of identified people, to how to clean up the river, Londoners were impassioned about what kind of legacy the sinking would have.Improvements to the sewage system, the adoption of emergency signalling lights on boats across the globe and the new Royal Albert Dock, which helped to separate heavy goods traffic from the smaller boats, all came as a result of what happened. Despite the huge loss of life and changes brought about as a result of the sinking of the Princess Alice, today there are few clues as to what happened on that fateful evening.The bank near where the steamer met its end is quiet; the silence occasionally broken by gulls cawing as they wheel through the sky, and the grating clang of machinery from the scrap yards across the river in Barking.The only reminder at Tripcock Point, close to where the tragedy happened, is a faded and graffiti-marked information board. Thanks to Joan Lock, author of The Princess Alice Disaster, for her help with this article.